Born in Paris, France, Alexandre Hammoudi began his training at seven with Max Bozzoni of the Paris Opera Ballet. He continued his training at the Academy of Dance Salle Playel in Paris from 1996-1999, received further training at the English National Ballet School in London and, most recently, at the School of American Ballet. Hammoudi has won numerous international competitions, including the Trophee Arabesque and the Biarritz Dance Competition. At 16, Hammoudi became a member of the National Ballet of Cuba and toured South America with that company. Hammoudi joined ABT’s Studio Company in 2002, joined the main Company as an apprentice in April 2003 and became a member of the Company’s corps de ballet in April 2004. His repertory with the Company includes the Rajah in La Bayadere, Pyotr and the Lead Highlander in The Bright Stream, Lead Mazurka/Czardas in Coppelia, Duo Concertant, Ivan in Alexei Ratmansky’s Firebird, the Jailer in Manon, the Nutcracker Prince in Alexei Ratmansky’s The Nutcracker, Olga’s Fiancé in On the Dnieper, Romeo and Paris in Romeo and Juliet, the Spanish Prince and a Fairy Knight in The Sleeping Beauty, Orion and Apollo in Sylvia, a featured role in Brief Fling and roles in Black Tuesday, The Brahms-Haydn Variations, Clear, Continuo, Désir, Glow-Stop, The Leaves Are Fading, Overgrown Path and Private Light. He created the Spanish Dance in Ratmansky’s The Nutcracker and roles in Everything Doesn’t Happen at Once, From Here On Out, Pretty Good Year, Seven Sonatas and Thirteen Diversions. Hammoudi has been dancing all over Spain as a guest artist with Angel Corella and Stars of American Ballet. 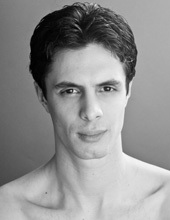 Hammoudi was appointed a Soloist at American Ballet Theatre in July 2012.